last night was a pretty scary thing for me. owen and i were playing in the living room, waiting for brian to come home. as we were chasing each other around the room, owen decided to grab onto the back of the couch and try to climb up it. he slipped and fell and hit the side of his temple on the hardwood floor. i quickly grabbed him and thought nothing of it.... kids always take spills. he cried, but then he took a long deep breath and i was thinking 'oh gosh, here is comes... the scream.' but nothing, he started passing out.... eyes rolling back and everything. i was in shock, i couldnt believe it. so i called 911 right away. as i was talking to the operator he started coming to... but of course the guy couldnt figure out where we lived.... incredibly frustrating. well, owen started acting ok, a bit of a scrape on the side of his head, nothing major. i started to tell the operator 'i think he's ok... he's ok...' the guy was like... 'nope, i'm sending the ambulance.' 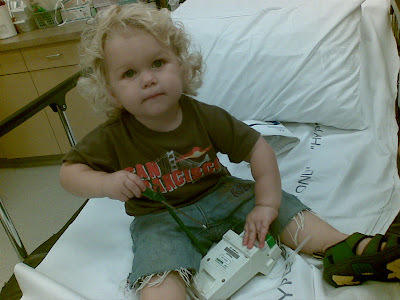 the ambulance came and the emt's were great with him and he was so fascinated with all the stuff in the ambulance, he was just as happy as can be. they did end up taking him to the hospital though for precautionary reasons. the whole ride he asked for dada. 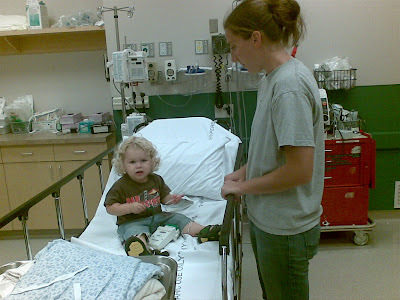 and when we did arrive and get checked in, he figured that since he was stuck in this bed he would stand up and tackle the pillow as the doctor and nurse came in. basically, he was fine.... and he passed out cause he was holding his breath and there isnt even a mark on his head. 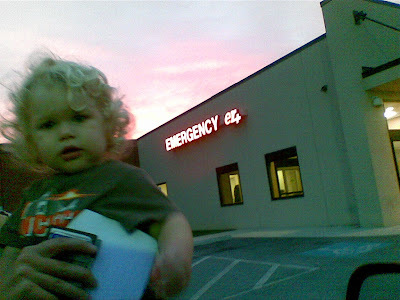 there is something about taking an ambulance to the er though, from the time i called 911 to the time we arrived home - 1hr. it's the way to go... that is until we see the bill.